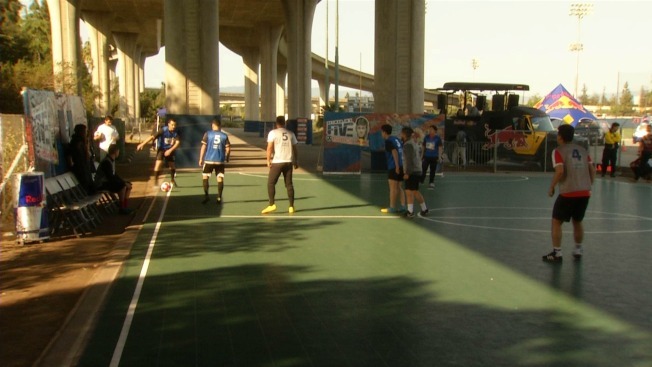 A worldwide soccer tournament orchestrated by one of the game's best players graced the streets of San Jose on Sunday as teams competed for a coveted spot in the United States finals. A host of squads suited up in the South Bay city to participate in the Neymar Jr.'s Five global soccer tournament, which is named after the Brazilian and FC Barcelona superstar, but this game of soccer isn't what most people are used to watching. The tournament features five-on-five matches without any goalies. The games are played on small, basketball court-sized fields made of either concrete, grass or turf. When one team scores a goal, the opposing team must relinquish one player. In order to win, a team must score five goals, which would effectively eliminate all the players on the opposition, or tally a higher number of goals after 10 minutes of play. "This type of soccer is really catching on," Eddie Salcedo, the tournament director for the qualifying matches in San Jose, said. "The great thing about this is you don't need a large grass field. You don't need a lot of players." The fast-paced, technical games features players between the ages of 18 and 25 as well as a few others over the age of 25. The winner of the San Jose-based tournament will earn a spot to play in the U.S. finals, which are scheduled for June 10 in Miami. The team to come out on top of that tournament will travel to Brazil for the international finals.